Icelanders are very proud of their lamb. The sheep roam free all summer and spend their days eating grass and herbs and relaxing inbetween. The pigs from Miðsker are a few of the “happy pigs” in Iceland. Fed on korn and potatoes grown at the farm, along with quality feed, the pigs walk free and get enough hey to feel comfortable, happy and stress free. 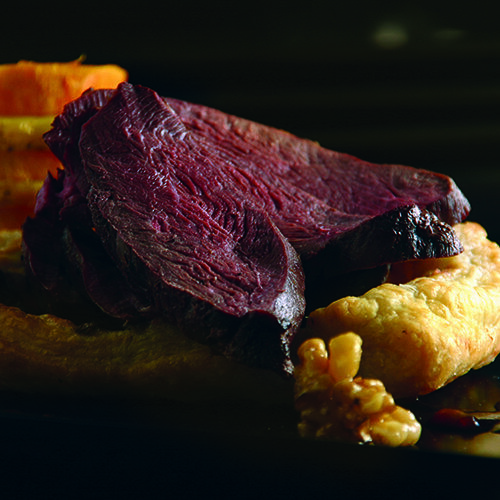 Icelandic beef is usually of top quality with good marbling due to the cold climate. Icelandic cattle are grass-fed. The most common game is reindeer, goose, duck and grouse. The Grey Goose and the Rjúpa (Ptarmigan) are the most common wild birds hunted in the region. They feed on berries and herbs which gives them their distinctive taste. The Rjúpa is a common delicacy in Icelandic homes for Christmas Eve. 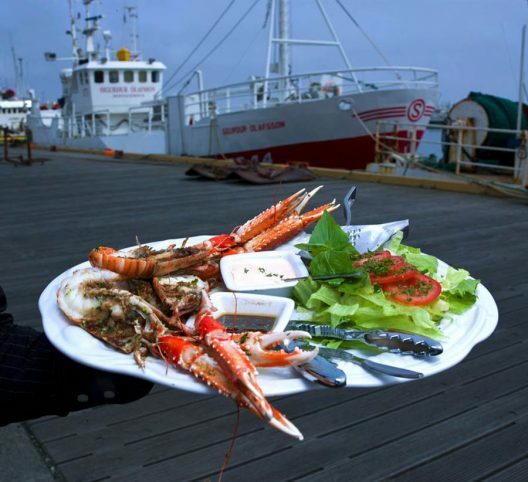 The Vatnajökull region is most famous for it´s Langoustine. Langoustine is what people in Iceland call lobster. It is much smaller than tourists are expecting. Although much smaller than regular lobster, it´s more rich, sweet and delicate in taste. The meat is also much finer and if cooked correctly is one of the finest produce from the sea. 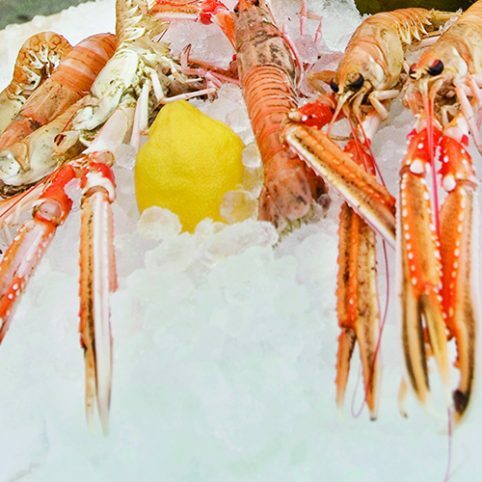 Langoustine is available all year round. Althouhg our fellow Scandinavians eat a lot of mackerel, it is not very common in the Icelandic kitchen. The fishermen in Hornafjordur are turning this around and are producing delicious hot-smoked mackerel and mackerel paté. All caught in the vicinity of Vatnajökull region. Haddock and cod are the most common fish Icelanders eat. Monkfish is for special occasions and the starry ray is mostly eaten the day before Christmas, then served “rotten” so if you are adventurous you should try it! Wild salmon and trout are the richest in omega 3 fatty acids and very good for you. And a delicacy you can find in most of the regions restaurants. Organic vegetables: Kale, carrots, herbs, potatoes and more from Hólabrekka, Miðsker, Seljavellir and Dilksnes. And the wild mushrooms from Haukafell make any meal a little bit better. 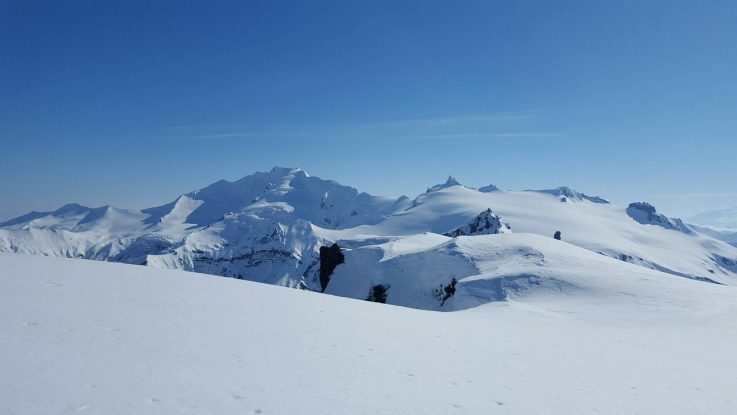 A little bit of german culture has popped up in the Vatnajökull region. A german saugage maker, Klaus Kretzer of Skaftafell Delicatessen, offers a variety of gourmet sausages – yes! Ölvisholt brewery makes a very special beer named Vatnajökull. Brewed from the clear icebergs of Jökulsárlón and spiced with local Arctic Thyme, allowing you to experience with all senses the Vatnajökull region in its purest form. It is only available in the restaurants in the Vatnajökull region. Even a reason on it´s own for Icelanders to visit! In the Vatnajökull region you can find blueberries, crowberries and Arctic Thyme all over. Berries are in season in late August and it´s a common sight to see berry pickers here and there in the area during the season. Feel free to pick some and enjoy them on your travels! The eggs come from a seabird called Svartfugl, Blackbird, a cliff-dwelling relative of the Awk family. Hunters risk their lives to capture these eggs from the cliffs and bring them to market. It is a real delicacy and very pretty as well. Árbær is a family owned milk farm where 220,000 litres of milk are produced annually. In May 2008 the first ice cream was produced there. That year 5,000 litres of milk went into the production and in 2009 they doubled that. No wonder, the ice cream from Árbær has been a hit with both tourists and locals and the farmers in Árbær deserve all the plaudits. They produce many different ice creams, also egg and dairy free.